Apelles of Kos (/əˈpɛliːz/; Greek: Ἀπελλῆς; fl. 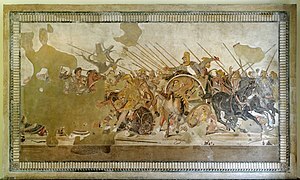 4th century BC) was a renowned painter of ancient Greece. Pliny the Elder, to whom much of modern scholars' knowledge of this artist is owed (Naturalis Historia 35.36.79–97 and passim), rated him superior to preceding and subsequent artists. He dated Apelles to the 112th Olympiad (332–329 BC), possibly because he had produced a portrait of Alexander the Great. Much of what is known of Apelles is derived from Pliny the Elder (Natural History, XXXV). His skill at drawing the human face is the focus of a story connecting him with Ptolemy I Soter. This onetime general of Alexander disliked Apelles while they both were in Alexander's retinue, and many years later, while travelling by sea a storm forced Apelles to land in Ptolemy's Egyptian kingdom. Ptolemy's jester was suborned by Apelles' rivals to convey to the artist a spurious invitation to dine with Ptolemy. Apelles's unexpected arrival enraged the king. Ptolemy demanded to know who had given Apelles the invitation, and with a piece of charcoal from the fireplace Apelles drew a likeness on the wall, which Ptolemy recognized as his jester in the first strokes of the sketch. The renowned work of Apelles provided several exemplars for the narrative realism admired by Greco-Roman connoisseurs, succinctly expressed in Horace's words ut pictura poesis, "as is painting so is poetry." Apelles seemed to have had a taste for elaborate allegory and personification, which he carried far in his rendering of Calumny, described by Lucian, in which an innocent youth is falsely accused by Ignorance, Envy, Treachery and Deceit. The story occasioning the painting was alleged to have been false accusations by a rival artist that Apelles took part in a conspiracy against Ptolemy IV Philopator. This almost led to the artist's execution. "In the Renaissance the exemplar of the poetic painting which was invariably cited whenever the art-poetry question was discussed was the Calumny of Apelles, known through Lucian's description." Sandro Botticelli's panel of Calumny of Apelles was painted in conscious striving to equal the painting in Lucian's ekphrasis. The Pyrrhonist philosopher Sextus Empiricus used Apelles in an analogy for how ataraxia (i.e., freedom from mental perturbance) is achieved. The acquisition of ataraxia was likened to the process where Apelles was trying to paint a horse. He wished to represent its foam (in Greek mythology, Poseidon created horses out of sea foam). He was so unsuccessful that, in a rage, he gave up and threw the sponge he was using to clean his brushes with at the medium, and its mark produced the effect of the horse's foam. ^ Bostock, John. "Natural History". Perseus. Tufts University. Retrieved 23 March 2017. "But it was Apelles of Cos, in the hundred and twelfth Olympiad, who surpassed all the other painters who either preceded or succeeded him. Single-handed, he contributed more to painting than all the others together, and even went so far as to publish some treatises on the principles of the art." ^ Guillaume Apollinaire retold this story in his essay "On the Subject of Modern Painting", originally published in Les Soirées de Paris, February 1912. This tale is a literary trope epitomizing the sublime simplicity of the greatest art in the hands of a consummate artist: comparable examples are Giotto's perfect circle, drawn freehand, and the scholar-painter Chuang-tzu's perfect crab, which, following ten years of preparation, was drawn in a single stroke without lifting his ink brush from the paper. ^ Martin Kemp,Behind the Picture: art and evidence in the Italian Renaissance 1997, p. 26f. ^ Athenaeus. Deipnosophistae. Book XIII Concerning Women. ^ Christiane J. Hessler, Ne supra crepidam sutor, Fifteenth Century Studies, 33 (2008), 133-150. This article incorporates text from a publication now in the public domain: Gardner, Percy (1911). "Apelles" . In Chisholm, Hugh (ed.). Encyclopædia Britannica. 2 (11th ed.). Cambridge University Press. pp. 160–161. Wikimedia Commons has media related to Apelles.